Let’s talk about Syrah, particularly that from France’s Northern Rhone. The steep slopes of this region produce some of the most legendary wines of the world. 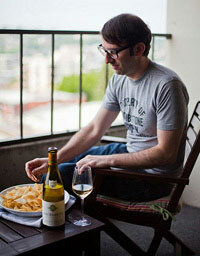 (The white wines are swoon-worthy, too.) So when I got the chance to sit down for a chat and to sample wines with Guy Sarton du Jonchay, Managing Director and Winemaker of Vidal-Fleury, I jumped at the chance. Hustling down to Seattle’s Renaissance hotel quite early in the morning, we grabbed some couch space in the lobby, blocked out the siren song of SportsCenter, and got to tasting and talking. Only 5% of all the wine in the Rhone Valley is produced in the Northern Rhone. You’ll only see Syrah when it comes to red grapes. Crozes-Hermitage is a great introduction to Northern Rhone Syrah. Sarton du Jonchay says Crozes-Hermitage is “easy to match with BBQ”. Try it slightly chilled. Find out what else Sarton du Jonchay revealed about a very special place for Syrah.